It’s almost New Year and here I am already back in the office. 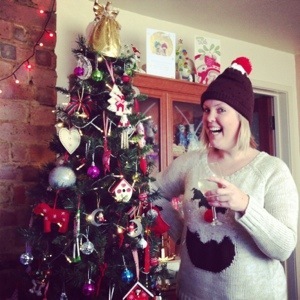 I blinked and Christmas was over. 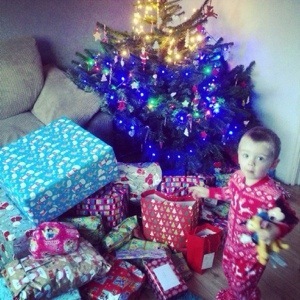 We had a fantastic Christmas Day. We hosted for the first time in our own home and we invited everyone that had helped make that possible. The day, of course, came with the normal stress and worry. I lost my rag a few times (hard to believe, I know) and spent many a night tossing and turning in bed, concerned about the amount of veg we didn’t have. 1. It turns out our mahoosive oven, isn’t in fact that mahoosive. 2. 7 types of vegetable is more than enough. 3. Provide your guests with felt tip pens and a tablecloth to colour in, and everyone is happy. 4. A little wee goes a long way over a tiled floor. Dexter, not me. 5. If you start drinking before midday, you will never actually feel drunk that day. 6. Even skinny men can break wooden chairs. 7. Don’t buy spare wooden chairs second hand from a dodgy woman via eBay. 8. 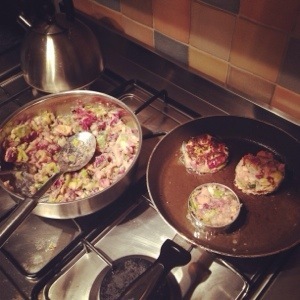 Bubble and squeak is amazing if you add braised red cabbage, sprouts, bacon, parsnips and chestnuts. 9. Toddler toys come in the most ridiculous amount of plastic and cardboard. 10. 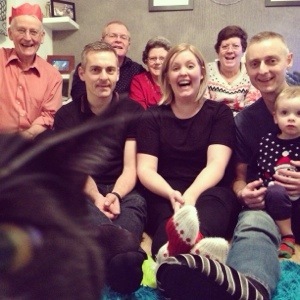 Even cats want to be part of the Christmas picture. It’s only a day but I know the memories will last forever so the stress, worry, laughter, tears and togetherness is all completely worth it. I hope you all had a very merry Christmas with your families. Dammit!!! I always forget about the Mama weeing!! !